This was written by admin. Posted on Thursday, February 7, 2019, at 7:27 am. Filed under Uncategorized. Bookmark the permalink. Follow comments here with the RSS feed. Post a comment or leave a trackback. Whatt’a bunch of malarkey. Three lazy parasites whining about losing their place attached to the host/Belmar to three other lazy parasites and a bunch of lawyers prancing around talking about the idiotic mess. Thanks much Matt. After what acting chief Hiseman and the D bag Doherty administration did to the Harmons. 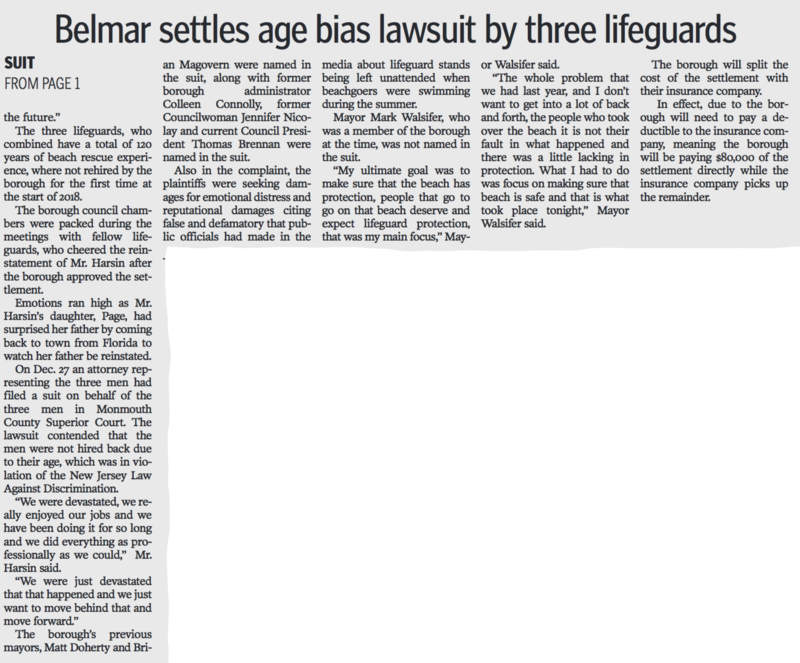 This lifeguard lawsuit settlement will look like peanuts! So when will Harrys swim test be? 200 in 3:20 right? So true #1, they should donate their take to some good cause. A lot of the towns new employees are retired cops getting 100k pensions already. How many new positions have been made since the Doherty/McGovern era ended? Didn’t Doherty say this was police chief Huismans idea? I think Huisman should pay the settlement out of his $200,000 salary. All while chief was at FBI training?? ?